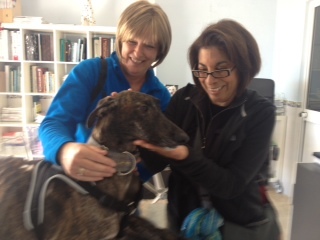 Once again, GRIN wants to thank Teri Rogo and her greyt team for the opportunity to do a presentation at the gathering about the situation in Spain and the plight of the galgos. Telma Shaw, GRIN Board Member and Adoption Coordinator and Mora Gonzani a GRIN volunteer shared with the audience some insight into the work that GRIN does to help the shelters in Spain. We are happy to say we had a great turn out and thank each person who came and showed their support for the galgos and podencos that need our help. We started our presentation with a slight hiccup, a technical snafu with our audio for a video presentation on the FBM Shelter in Sevilla, but although the sound was only projected through our lap top, you could have heard a pin drop. We know the visuals told the story of this one shelter and how they work to save galgos at their rehabilitation center. Thanks everyone for bearing with us for the first half!! Next year given the opportunity, we promise to do better!!! We also had a surprise guest all the way from Arizona via Spain. A special little Podenca who GRIN brought here last spring..her name is Trini, originally from Galgo Connection Spain www.galgoconnectionspain.org Thank you Keith Lewis for bringing your sweet little Podenca so that all our attendees could meet her! She is such a dear little soul a beautiful Ambassadog for the Podencos!! There is so much that could be said about the situation in Spain. I decided to share some slides of my last trip to Spain in the Fall of 2012 and share from the heart the work we do to help the shelters that we work with. I shared about Galgos en Familia, Ecija Shelter, 112 Carlota Galgos and Galgos del Sol as these were the shelters we visited in the Fall. Mora Gonzani also gave her presentation on one shelter she visited in the Fall. That shelter is the finca/ranch of 112Carlotagalgos in Malaga. Founded by Char del Rio and run as a family affair full of love and hard work for the galgos and podencos. She also talked about an amazing blog site www.yeartohelp.com written by a fantastic roving photographer Martin Usborne of the UK who visited Malaga and Chars shelter, to learn about the plight of the galgo. Thanks to his beautiful artful photographs he has been able to donate to the cause of the galgos and has a following that is also helping by supporting his work. We enjoyed and appreciated having the opportunity to share our passion to help the galgo's "cousins" of the greyhounds at a greyhound event and we are touched by the people who want to help us help them. Thanks for your support!! We also want to say a BIG thank you to all those folks who brought bag after bag of collars, leashes and coats for our shelters that we support. These supplies are very much needed in Spain. As the dogs are adopted out, they are sent with a martingale collar for safety, and as we know, they are not readily available in Spain and also the cost is prohibitive. We are so happy to be able to send these supplies with our volunteers who go to Spain. Next shipment leaves with me in April. Thank you so much everyone! We were able to spend some time in the beautiful Solvang area as well with our galgos and greyhounds! 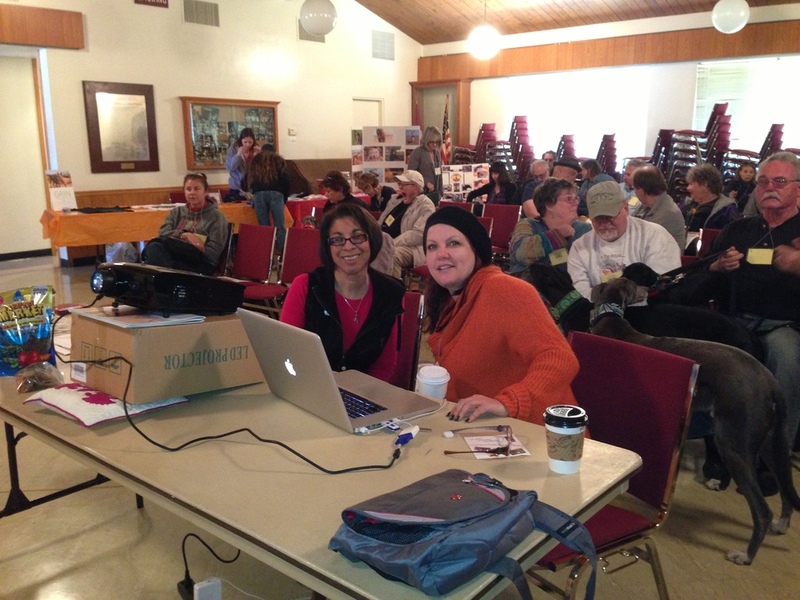 On Saturday evening we had the pleasure of hearing Dr. Couto speak once again at the Solvang Greyhound Gathering. Dr. Couto is an amazing advocate for the greyhounds and the galgos! He shared with us his recent work in research as well as sharing his passion for volunteering in Spain at Scooby Medina Shelter www.scoobymedina.com with his veterinary students. We thank Dr. Couto for all he is doing for the health and benefit of greyhounds, galgos and sighthounds world wide! Wow what a great time we had.. here are some final shots from the event..
SUZANNE CARR ROSSI / THE FREE LANCE-STAR Michael Owens (left), of the Sighthound Underground rescue group, cradles Calina, a Spanish greyhound who was rescued by Stafford County's April Lamb (right). Lamb is holding Calina’s sister Mariposa, who is available for adoption. 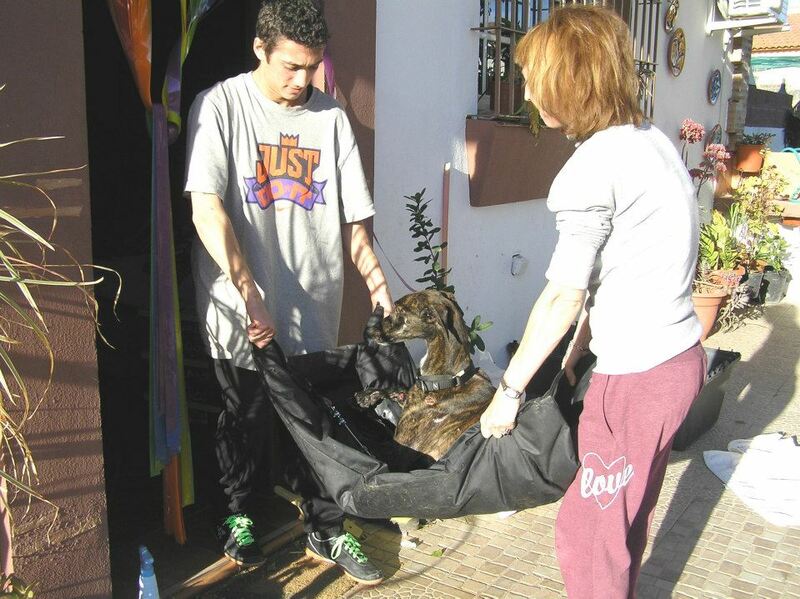 The two pups—known as Galgos, or Spanish greyhounds—were rescued from Spain. 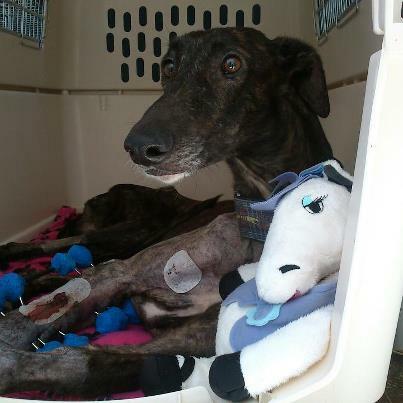 SUZANNE CARR ROSSI / THE FREE LANCE-STAR Mariposa, a Spanish Galgo greyhound, is available for adoption. Her sister Calina found a new home in Stafford County. Little Calina snuggled up with blankets on the couch behind her new mom, already comfortable in her Stafford County home. She was napping the morning away before new pals would be over for a doggie play date. “You don’t know how lucky you’ve got it, little girl,” said April Lamb, sharing the story of her family’s new addition. 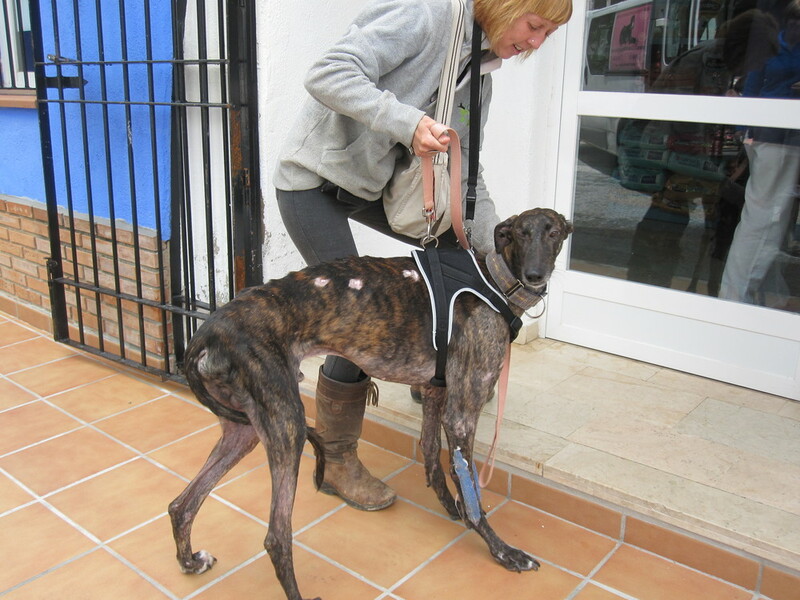 Life didn’t always look so plush for the 12-week-old puppy, a Spanish Galgo recently transported across the world. In Spain, the ancient breed—which is related to the greyhound—is used for hunting. When the dogs are no longer needed, they’re brutally disposed of, according to several rescue organizations. Adoption coordinator Telma Shaw, of Galgo Rescue International Network, said the dogs aren’t viewed as living creatures, but rather as tools of the trade. “What do you do with a tool? You stick it in the shed until you need it again. That’s the exact mentality of these hunters,” Shaw said by phone from her Oceanside, Calif., home. Already the owner of three Italian greyhound rescues, Lamb, 53, learned about Galgos just a year ago when pondering fostering another dog. Barbaric images posted online haunted her for days, and she made a promise that she’d share her love with one of the dogs. She found GRIN, emailed with Shaw for months and finalized the puppy’s adoption in December. Calina—known as Lola back in Spain—made her big journey earlier this month. She and her sister, Mariposa, had been turned in to a shelter in Malaga, on Spain’s southern coast, and Shaw saw them on a Facebook page. Sharing a large travel crate, the pair of dogs flew from Madrid to Miami with two other dog parents-to-be, then were driven to Georgia to meet Lamb, and finally up to Virginia. When all is said and done, the process costs adoptive families about $1,500. Mariposa is still awaiting adoption. Calina, meanwhile, is getting used to her name, which means “mist” in Spanish. Lamb has high hopes that the brindle-patterned pup will be an ambassador for the breed, clearing the mist that she says has been hiding the fate of the Galgos. Lamb’s family had a fit when they learned of her plans, however. Why not adopt from a local shelter, where there are plenty of dogs that need homes? But Lamb, who has worked at vet offices and as a nanny, set her heart on helping the breed. She described herself as the child who brought strays home—only to be told that she’d have to wait until she had her own house one day to do that. Now, she’s making good on that promise. “She’s been following the dogs for a while. She really, really wants to get this known in the United States,” said Shaw, of GRIN, which has facilitated more than 40 adoptions in the past year. A Virginia group, Sighthound Underground, also facilitates adoptions. So does Save A Galgo Espanol, based in Pennsylvania. Playing in her fenced backyard in North Stafford with her siblings and new pals recently, Calina hid behind a stack of firewood. Her bright purple coat gave her away though, and Lamb scooped her up to bring all the small dogs back inside. Bigger paws indicate she’ll grow larger than the adult Italian greyhounds, perhaps up to 50 pounds. Friend Beth Gresko was excited to meet the puppy. “I just love the look of her muzzle,” she said about the long, narrow and dark face. The calm puppy doesn’t know she’s been put on a mission here in America. “She seems more content to lay down and watch,” Lamb said. The Galgo, or Spanish greyhound, is used for hunting in Spain. But at the end of the hunting season, the dogs are often abandoned or killed, rescue groups say. For more information, visit galgorescue.org or sighthoundunderground.com.